WHAT CAN I SAY FELLOW OLYMPIANS BUT THANK YOU TO EVERYONE WHO ATTENDED OUR OLYMPIC FUN AND CLUB SHOW SUNDAY. WE HAD OUR BIGGEST ENTRY YET SINCE WE STARTED OUR B.S. CLUB SHOWS AND DESERVEDLY SO AS LANE FARM DID ITS BEST TO SUPPORT AND WELCOME THE LONDON 2012 OLYMPICS!! Beginning with our Ancient Greeks 55cms and then our Pairs Torch Relay, the excitement mounted as the competitors received their wonderful rosettes (beautifully made by Supreme Rosettes) and London 2012 medals. 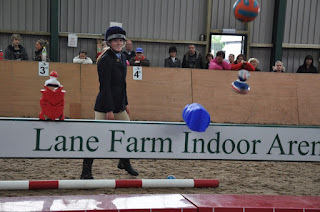 After some talented British Showjumping Club Pony classes, it was time for the Opening of our Lane Farm Olympic Games! 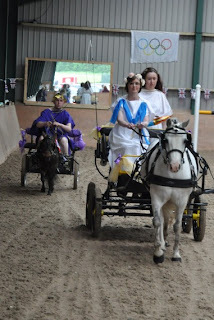 David Wright with Casper and Fiona and Jessica Rooney with Bubbles entered the indoor arena dressed as our Ancient Greeks. With inflatable Olympic torch held high Jessica lit the Olympic flame. Our special Olympic Games class was ready to start!! 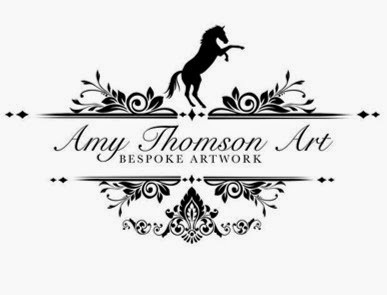 How great was that, big thanks to them. The 'Games' class made up of showjumps, x-country, aim and fire knock the Olympic ducks off, bending and a race to the finish, after passing the flag; was brilliant entertainment and thank you to all our competitors who were great sports to enter. From little Charlie Parker and friends to more senior!! Thanks Peter Blackburn you held the flag for us more mature Olympians !!!!! 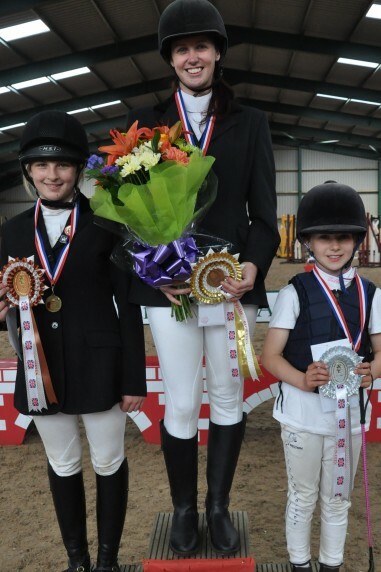 Great fun was had and our Gold, Silver and Bronze Medallists were presented their awards, complete with podium, by our own much reverred ex-international showjumper and friend of Lane Farm - Andrew Fielder. Gina Jennings who is Supreme Rosettes and who sponsored our prestigious class was in attendance to pass the prizes to Andrew, it was brill with lots of wide smiles - happy days! A day like Sunday couldn't deliver without the great help from our Lane Farm team, thank you guys you know who you are - great stuff!! WELL DONE TO ALL OUR COMPETITORS, THANK YOU FOR GIVING US A GREAT DAYS SPORT!! 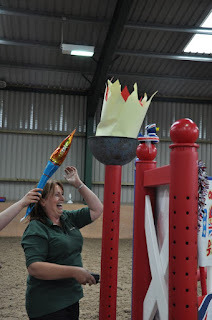 DON'T FORGET PLEASE REFER TO OUR PHOTOGRAPH ALBUM (on our Lane Farm Facebook page) - AND MAY I TAKE THIS OPPORTUNITY OF THANKING MR PETER GREY FOR TAKING SUCH GREAT PHOTOGRAPHS A LASTING RECORD OF OUR OLYMPIC DAY.